A Twitter friend suggested we ‘cross the border’ a mile away back into England for nicer weather. Very tongue in cheek but worth a try. We needed a few supplies, the bottled variety, so off we went. Ludlow, in Shropshire, destination of the day. Over the border back into England and the clouds lifted. A small town with a myriad of different architectural styles. The older buildings side by side with younger ones, the youth of today supporting the older generations. 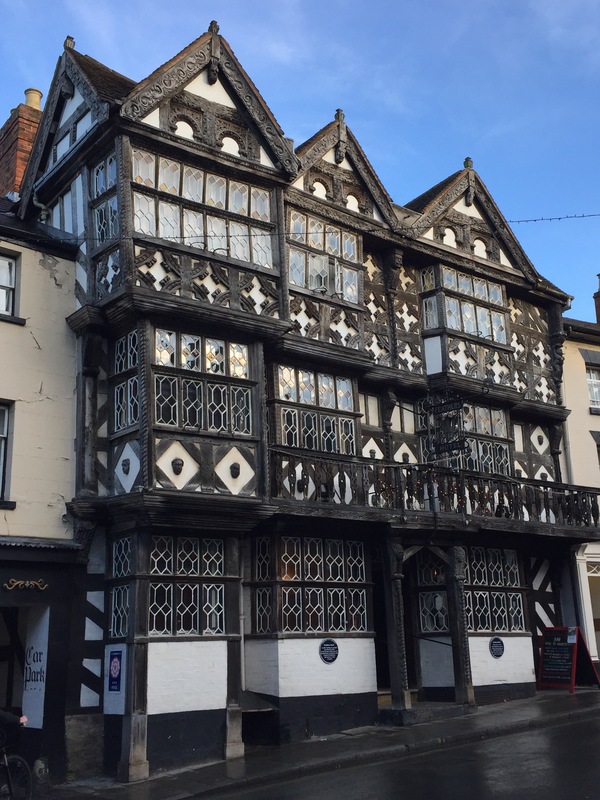 The Feathers, described as the ‘most handsome inn in the world,’stands centrally in Ludlow, like the matriarch of the family watching the antics of the town. Toes warmed back out into the cold. Christmas is starting to wrap itself around everything outside. The local market stalls offer a variety of Christmas offerings. The town tree stands proud in the centre awaiting patiently for it’s twinkly lights to be draped on its branches. Bah humbug! It’s the middle of blooming November! I still have pumpkin at home and can still smell the fireworks, for as much as I do love Christmas we still have 5 or 6 weeks to go! 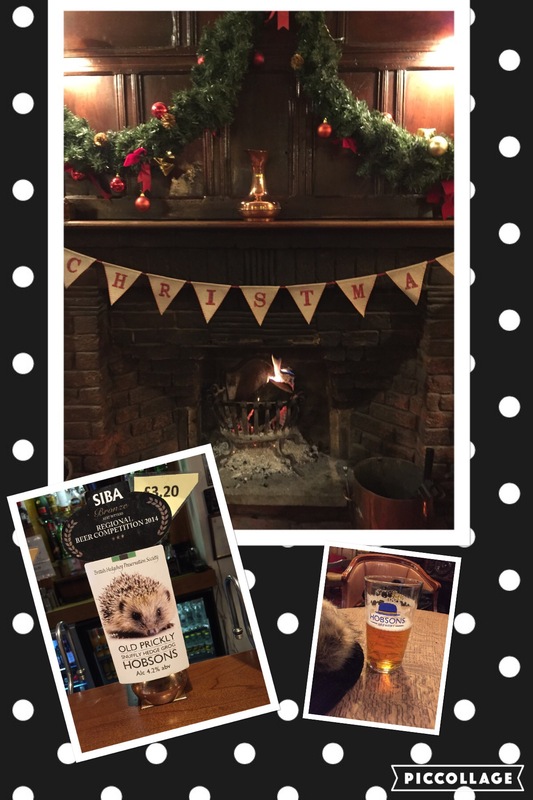 Leave it in December – I really must start Christmas shopping… A trip down the hill across the River Teme using LUDFORD Bridge and we are in Ludford. 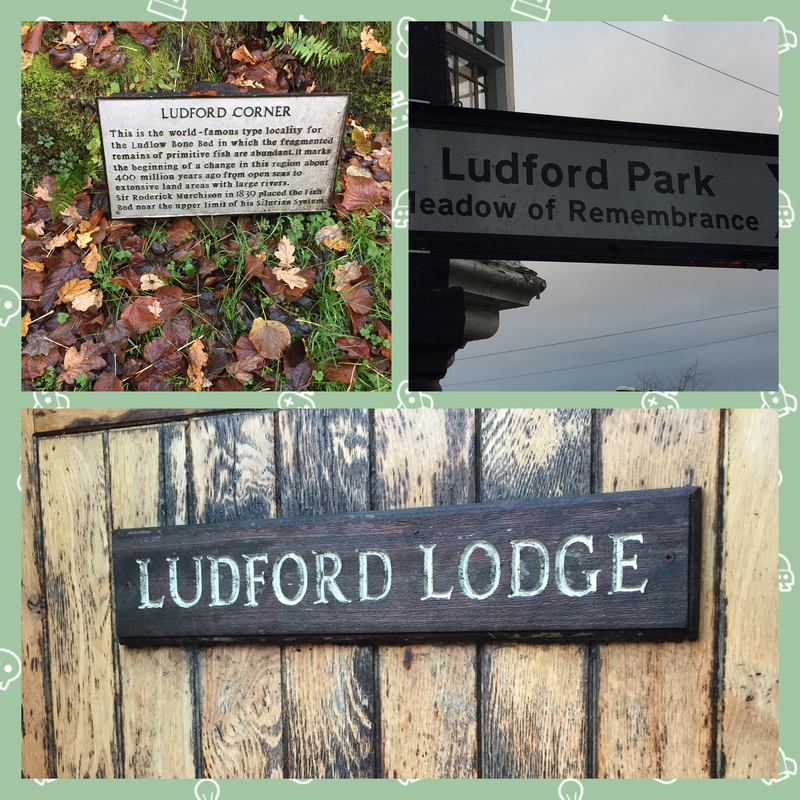 For those of you that don’t know and are reading this a little confused, our surname is Ludford. 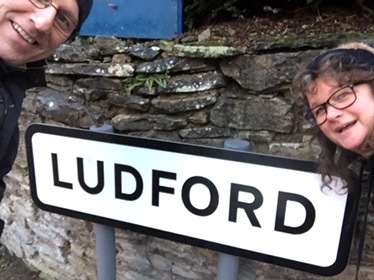 Despite The Boss moaning and grumbling as I snapped away at everything with our name on it I still managed to persuade him to have a quick selfie at a busy set of traffic lights with all the locals looking at us wondering why on earth we’d want a photo with their sign. 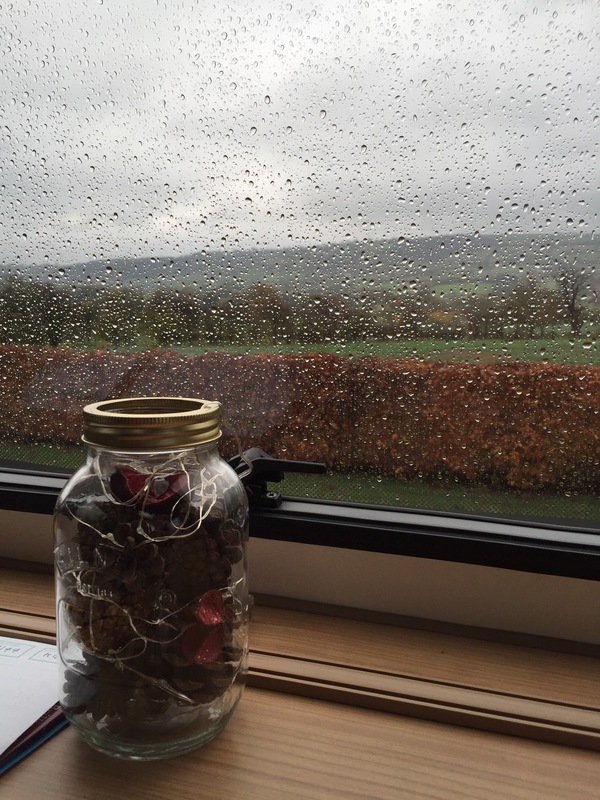 Next day – Raining again – does it ever do anything else? Let’s go for a drive says The Boss. Cabin fever must be setting in. Off we go with the intention of grabbing lunch on the way. Puddled B roads lead into country lanes obviously well driven, we know this due to the grass growing down the middle of the lanes. Not a pub insite, not a whiff of a restaurant chain or burger van, at this point, well past lunch, The Boss is grumbling, but not quite as loudly as his stomach. Out of the mist, ruins appear. 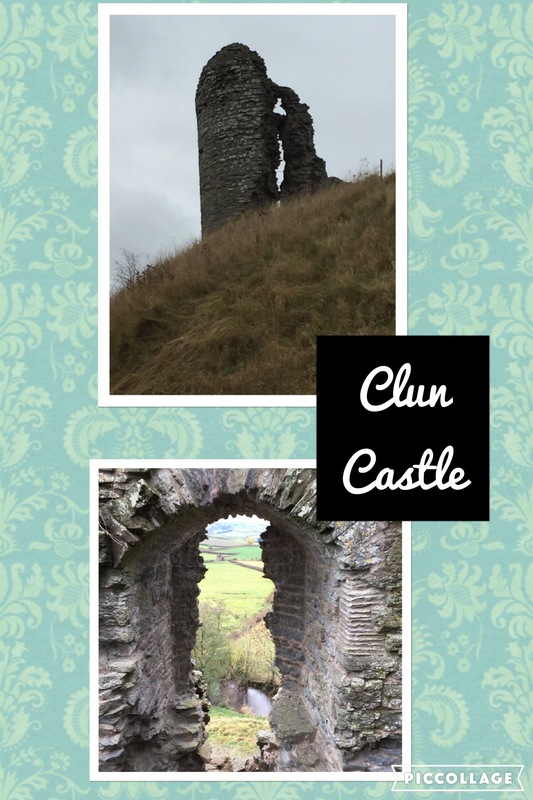 The small town of Clun, built around the spectacular ruins of Clun Castle. 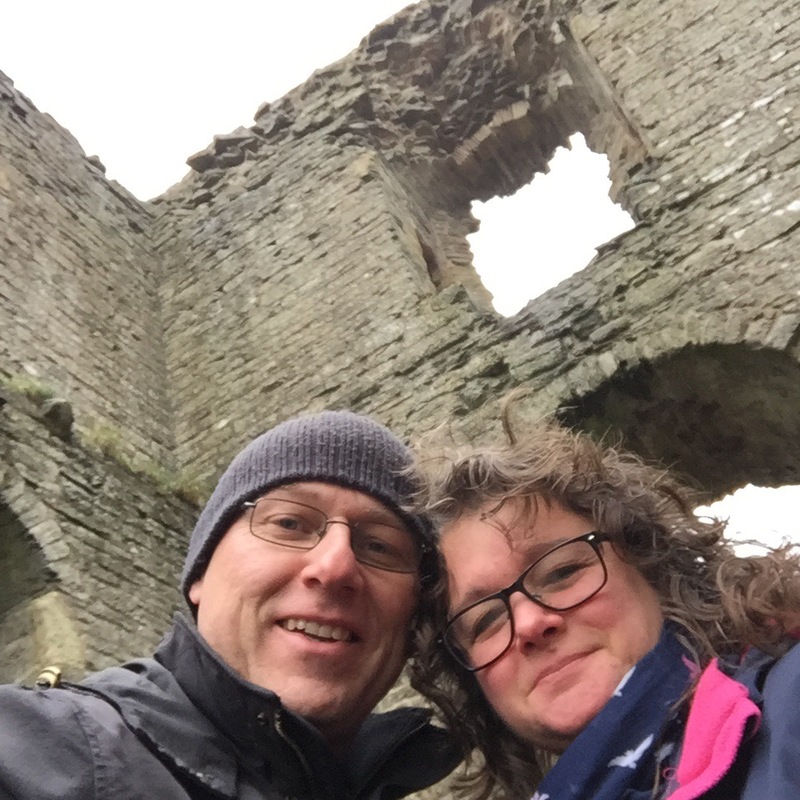 Grumbling stomach forgotten, car parked up and off we head up a muddy path towards the 14th century castle. A scaffolding walkway leads you into the centre of the Great Tower. Pigeons shelter from the rain now within the walls of the home of who was once the wealthiest man in England. Spectacular views spread through the remaining windows, leaving you wondering who else gazed at these views over the last few hundred year. Back to the car, God its cold out there. Heater on 24 degrees and off we go. 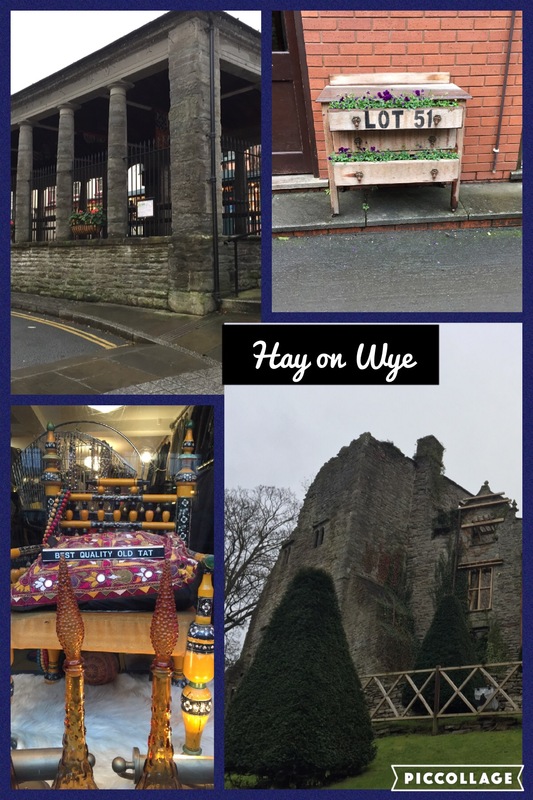 Destination Hay on Wye, literary home to the Hay festival. Before we hit Hay, is that a pub on the right? Not sure. The most un pub-looking pub. The Boat Looks from the outside like a large house, very little signage but a very busy car park. Stepping into a very busy dining area. Table found, two very large roast beef dinners ordered. Time to eat. The most delicious looking roasts arrived with the biggest homemade Yorkshire pudding and side plates of vegetables. So hungry I didn’t even think to take a photo to tickle your taste buds – sorry. Bellies full as we park in Hay on Wye. It’s a Sunday and many of the shops are closed. So different to back home where every shop throws their doors open seven days a week. Book shops are aplenty and that lovely old book smell wafts out onto the streets. 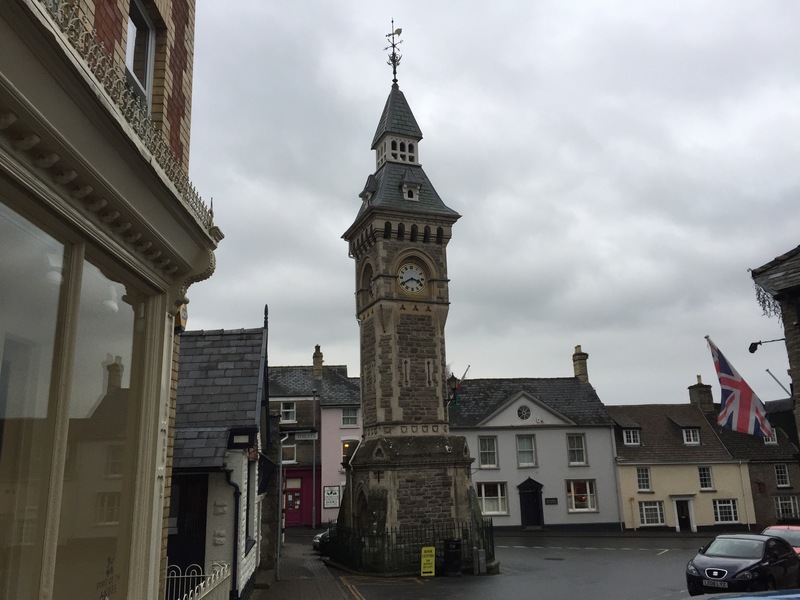 Famous for it’s literary Hay Festival the town attracts bookish people all year round. Filled with a variety of small local shops too, off I went. I can window shop with the best of them. Oohing and aahing at eccentric window displays, books and anything else I could cast my eyes on. The Boss, bored to death, plods silently behind me raising his eyes as he stuffs his hands further into his pockets announces he needs the loo. Signage points us towards a rather beautiful clock tower. Public toilets are opposite. The grumbling gets louder, imagine, 20p for a wee! Daylight robbery. In the absence of any other loos he reluctantly pays, insisting that once he has finished I go in, 2 for the price of 1! The Boss loves a bargain!